The job: The bike preparation involves lowering the handlebars and seats, turning the handlebars and attaching the pedals to the frame. The bikes must be streamlined as much as possible so we can get more in the cargo container. No bike repair experience is necessary. If you have your own tools we would appreciate you bringing them to the event. Please make sure you have your name marked on them for easy identification. We mostly use a 9/16” open end wrench, 1/2” and 9/16” box end wrench and a 5mm allen wrench. Some volunteers like to work with gloves. We will be outside so please dress for the weather. If you think you will be thirsty or hungry please remember to bring some water and a snack. Wearing closed toed shoes is best while working around the bikes. Important: Every volunteer must download, print and sign the release of liability form (link below) and bring it in with you on May 18th, if under 18, a parent or guardian will need to sign the form. When you arrive please go to the volunteer check in/check out table, sign in and drop off the release of liability form. It will also be at this same area that you will check out when you leave. If you need community service hours, we will gladly give you a signed form showing your volunteer hours. You can ask for the form at the volunteer check in/out station before leaving for home. This is a wonderful program that collects, packages up, and sends donated bikes to Africa. 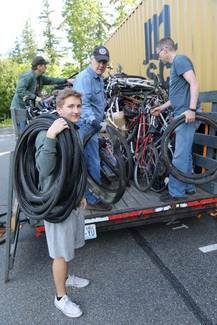 Bikes can be dropped off at CWU Sammamish Campus (120 228th Ave NE, Sammamish, WA 98074).